Brazilian President Dilma Vana Rousseff’s impeachment on May 12, 2016, was clearly due to consistent missteps by the president and her colleagues, but the underlying contribution to the Brazilian crisis — and crises in other countries — of the slowdown in the People’s Republic of China cannot be overstated. 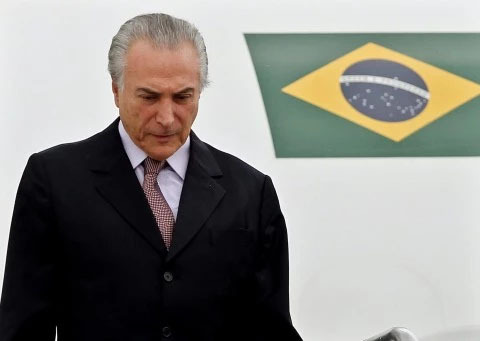 Brazil’s economy has been in significant decline since the second quarter of 2014, with the exception of a minor (one-tenth of one percent) rise in last quarter of that year. All 2015 and early 2016 saw the Brazilian gross domestic product decline. Overall 2015 contraction was 3.8 percent, the worst annual performance since 1991. Brazil’s interim president, Michel Temer. Much of this is due to the contraction of PRC mineral resource requirements from its major supplier nations, coupled with (and inducing) a reduction in commodity pricing due to the lower demand. Along with this was the global collapse of oil and gas prices (and rising availability), which affected the fortunes of the Brazilian State energy company, Petrobras. President Rousseff, in the face of this, was unwilling to cut spending — or corruption — and had committed Brazil to major high-profile, high-budget projects, such as the football World Cup and the 2016 Summer Olympics. Adding to the concerns for Brazil was the emergence of the mosquito-borne Zika virus, which has deterred tourism to the country, leading up to the Olympics. If the collapse of demand for commodities, spurred by the PRC, was of profound concern to major economies such as Brazil and Australia, it has had an even great impact on many African economies, including South Africa, Nigeria, and Sierra Leone. Sierra Leone’s GDP grew in 2014 by 7.1 percent overall, and only by one percent after iron ore production was taken out of the equation. The GDP contracted by an estimated 21 percent in 2015, of which declining iron ore exports accounted for 20 percent. None of the countries which were overwhelmingly dependent on the PRC market have taken significant steps to either cut spending or to build compensatory economic mechanisms, or, indeed to stabilize social unrest and voter anger. The so-called BRICS states — Brazil, Russia, India, China, and South Africa — were widely perceived as a new strategic bloc, and while India, the PRC, and Russia have retained some flexibility, all are now suffering, and India and the PRC are increasingly competitive with each other. South Africa’s economy continued to slide through 2015 and 2016, and International Monetary Fund data released in a KPMG report on May 11, 2016, showed that South Africa had slipped into third place among African economies, down from first place in 2011 (when Nigeria overtook it). Egypt moved into second position by year-end 2015 (with a $330.765-billion GDP), compared with South Africa at $312.957-billion, and Nigeria at $490.207-billion (itself down from 2014’s $573.999-billion). All of these factors, coupled with the ongoing decline in economic performance in the major industrial powers, were likely to feed on themselves, creating an upsurge in unrest and dissatisfaction within many African societies and some Latin American states, stimulating both domestic unrest and — in the case of Africa — continued upward pressure on outbound migratory trends. This contributes to economic, social, and security dislocation in countries absorbing the migrants. Within this framework, many African societies, in particular, are bemoaning the declining interest of the U.S. and Europe to provide compensatory aid increases, and are finding that their new economic relationships with the PRC and India have not geared them to address unemployment issues created by trade fluctuations. Brazil and South Africa, like Egypt, still have significant industrial sectors which provide a partial cushion, but client states for their defense and manufacturing exports may now be harder to find. Meanwhile, agricultural output languishes in most African states. And while Suez Canal revenues may not rise as rapidly as anticipated, because of the slowdown of global maritime-based trade, Egypt is better placed than most to sustain its economy. Nigeria, still largely a single-commodity economy, can expect to see a further decline during the coming year, and the new Government, under President Muhammadu Buhari, has not cut spending commensurate with the fall in oil and gas revenues. All of this begs the question as to why most states continue to operate in a “business as usual” cycle, when clearly a new cycle has begun.